career in cartoons including Scooby Doo, Rugrats, Smurfs, Flintstones, Jetsons and more. The exhibit is free and all works are available for purchase. 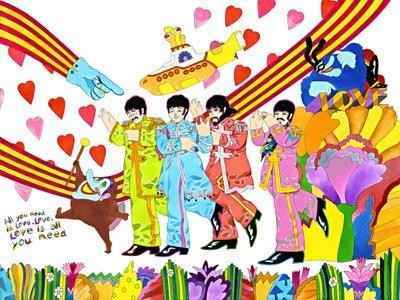 Who: Ron Campbell, Director of the Beatles 1960’s Saturday Morning Cartoon series and animator of film Yellow Submarine. Also involved in Scooby Doo, Rugrats, Smurfs, Winnie the Pooh, Flintstones, Jetson’s, George of the Jungle, Teenage Mutant Ninja Turtles and many others. What: Ron Campbell will be offering for sale original cartoon paintings of the Beatles both in their Saturday Morning Cartoon and Yellow Submarine roles as well as various other works from his 50-year career in animation including Scooby Doo, Smurfs, Rugrats and more. Details: Ron Campbell, director of the legendary Saturday morning Beatles Cartoon series that aired on ABC from September 25, 1965 through April 20, 1969 and animator on the Beatles film Yellow Submarine will make a rare personal appearance at Greenwich House Gallery, 2124 Madison Street in Cincinnati, OH for 3 days only.